Crystal Shard Cluster Miniature There are 11 Reviews. The Crystal Shard Cluster makes a great tabletop miniature accessory for any Crystal Cavern, Crystal Forest, or Crystal Mountain tabletop adventures. Dense areas of crystals create difficult terrain and hinder visibility. Ice crystals, magic crystals or other types of spiky geodes can cover up to around several square miles of area. Shards of the crystal (such as Mundane Crystals or Augment Crystals) can be used to craft very useful items. Mundane crystals can be used in place of metals when using a special forging process. The fortified crystal is similar to masterwork steel weapon or armor, except for visual appearance. Augment Crystals can be combined with masterwork or magic weapons, armor, and shields to grant them additional properties. Armor Augment Crystals, Shield Augment Crystals, and Weapon Augment Crystals can be immensely handy. Most psionic armor, shields and weapons incorporate one or more crystal components into their construction. Some are composed entirely of crystal. Crystal shards may also assist with the use or activation of magic. 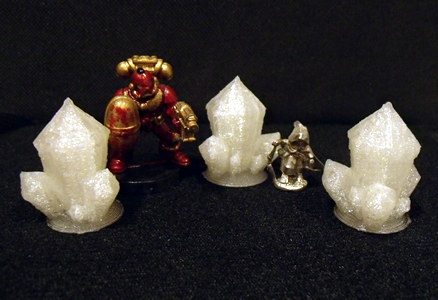 Each Crystal Shard Cluster Miniature is made individually WITHOUT using a manufacturing mold.